Jack Wilshere could be facing another lenghty period on the sidelines after scans suggested that his latest injury is much worse than anticipated. According to reports, the England midfielder has a suspected hairline fracture in his left fibula (the smaller of the two bones that make up the lower leg), which would be another set back for the progres of the 23-year-old Arsenal midfielder. 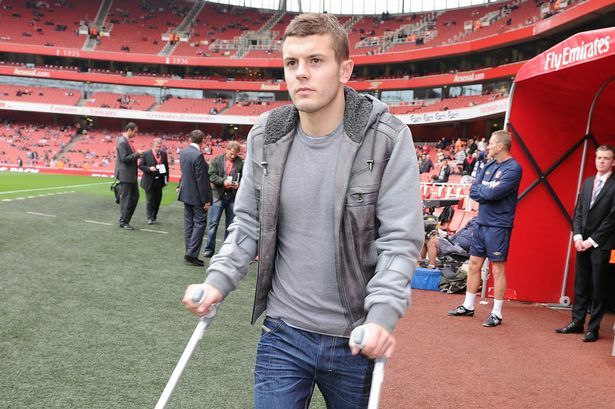 Wilshere has been unfortunate with injury and started just nine Premier League games last season after he picked up an injury in a game against Manchester United last November. He only made his comeback from that injury in May and while he was able to play a bit-part role in Arsenal's end of season fixtures that included a substitute appearance in their successful FA Cup final team, Wilshere had set his sights on getting himself fully fit for the start of this season. Wilshere has spoken about his fitness regime this summer as he looks to get himself in shape for the new campaign, as he suggested he needed to be fitter to withstand the demands of Premier League football.